This classic beauty makes a stunning wall quilt that finishes at 54"x54." Elegant Garden by Edyta Sitar of Laundry Basket Quilts is a 12 month Block of the Month program. You'll receive 2 blocks per month and border and medalion block fabric in the last month. Only 19.99 a month! Pam & Nicky Lintott turn their attention to quilting with rulers in this new collection of 18 quilt patterns. Tables are always the focus point for Nancy Halvorsen's decorating. Table Please Part Two features Autumn, Christmas and Winter table runners and decorations. It's back! 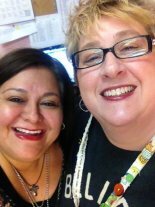 Join Wendy and Andree all day Saturday, March 29, to work on your projects. It's a fun and easy way to get away from the house, have fun with friends and complete (or make considerable headway) on your quilt projects. A day of uninterrupted sewing and a fabulous meal with fun facilitators. What more could you want? Reserve your spot today as space is limited. Need to de-stash so you can re-stash? Need to reenergize your projects? 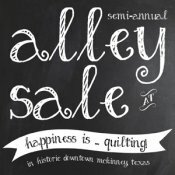 Join us for the Alley Sale - the Quilter's Ultimate Garage Sale! All the fun will take place Saturday, April 12, from 10 a.m. - 4 p.m. Jack Gresham of Mobile Knife Sharpening will be there to sharpen your scissors and blades from 10 a.m. - 12:30 p.m. Spots are filling quickly! Reserve your spot today for $10. Don't you love how the fabrics blend from one to the next in the Blooming Nine-Patch quilts? Join Janet on Wednesday, April 2, from 10 a.m. - 3:30 p.m. to get you started on making your own Blooming Nine-Patch quilt. You'll discuss color choices as well as piecing your blocks. Register today. Join M.J. once a month for Tips and Techniques with an Expert. Each month this award winning quilter will share a valuable tool or technique to produce beautiful quilts that you are proud to show. She will cover all aspects of quilting. Evening sessions begin on Thursday, April 3, from 6 p.m. - 8 p.m. or daytime sessions begin on Monday, April 14, from 12 p.m. - 2 p.m. Spots are filling up fast. Register today. Have you always wanted to make a Kim Diehl quilt, but didn’t know where to start, or the patterns looked too involved? In this club hosted by Penny, meeting the 3rd Saturday of every month, we will complete one of her projects per quarter. Register today. This is a monthly 2-hour class designed to help you improve your piecing skills. Once a month, MJ will teach a skill and block that will be built upon in the next class. First session meets, Monday, April 21, from 10 a.m. - 12 p.m. In the first quarter, you'll cover four and nine patch blocks, half square triangles, and flying geese. Register now.